WHAT! no! my hair was all one length and i just wanted layers! GOD IT WAS AWFUL! so basically i don’t like people cutting my hair! But unfortunately it had gone sooo long without a cut and was just a tangled mess i looked like a hobo dread lock fruit loop….couldn’t brush it properly and had to get my mummy to brush my hair at times! I’M 25!!!!!! plus the amount of shampoo and conditioner! wow! no wonder i was always cursing when paying for my shopping and weekly cosmetic products! So basically i decided to have it cut! what started as a trim turned into 5 inchs of the length and do you know what I LOVE IT! it feels awesome, fresh and bouncy. 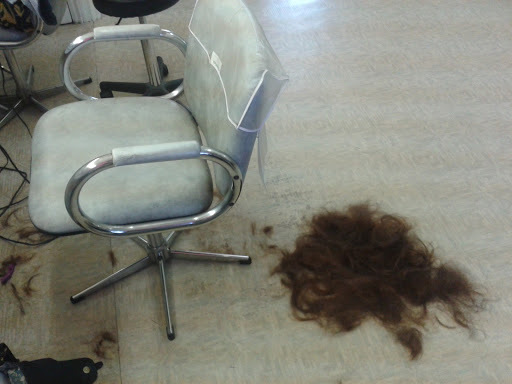 I have really thick hair so it was awesome to feel some weight being taken off…..! but here’s the mess i left behind ha! So thank you to my lovely wonder hair dresser, Lisa @ talking heads in Northampton! I LOVE MY NEW LOOK!